There are two important components of dental care: a good oral hygiene routine at home, which should consist of twice daily brushings and daily flossing; and professional dental care, which should include routine dental exams and cleanings at least once every six months. At Mitchell Dental Spa, Dr. Margaret Mitchell offers all types of general dentistry services, including dental exams and cleanings. To schedule your appointment, contact our Chicago, IL practice today. Dental X-rays: If you are a first-time patient, we will take full dental X-rays so Dr. Mitchell can have a more detailed view of all of your teeth. During follow-up appointments, we may take a smaller set of X-rays so we can see any changes to your teeth. Visual assessment: We will perform a visual assessment with hand-held dental tools. This portion of the exam will include checking the teeth for signs of decay, looking for signs of gum recession and periodontal pockets, and evaluating the amount of plaque that has accumulated in problem areas such as the back teeth and along the gum line. Oral cancer screening: Dr. Mitchell will also perform an oral cancer screening to check for any red or white patches, lumps, or areas of tenderness in the soft tissues of the mouth. When patients undergo dental exams every six months, these tests help your dentist identify dental problems when they first begin, so they can be treated more conservatively. For example, if we detect a small cavity, we can treat it with a simple filling. If the cavity is not treated, it will continue to get worse, and the tooth may eventually require a crown or even tooth extraction. 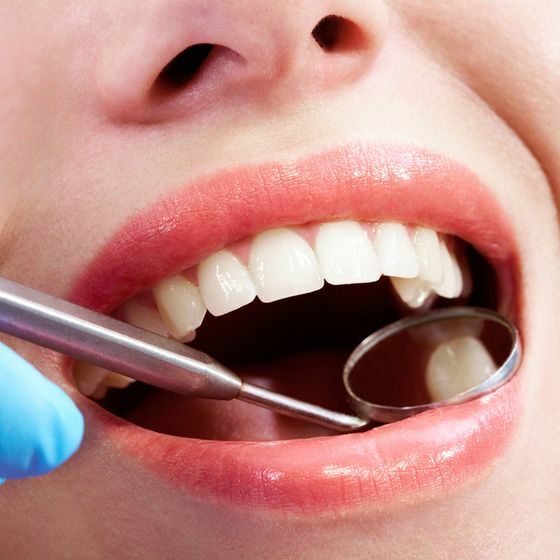 During your dental cleaning, we will use specialized dental instruments, including picks, to remove plaque and calculus from all of the visible surfaces of your teeth. For most patients, hardened plaque, called tartar or calculus, build up on the back teeth, between the teeth, and along the gum line. Throughout this cleaning process, we will continuously rinse the mouth to flush out all debris. Once all signs of plaque and tartar have been removed from the teeth, we will use our polishing instrument and cleaning paste to smooth and polish the surfaces of the teeth. Finally, we will floss all of the teeth to further remove any debris. After your professional dental cleaning, your mouth will feel fresh and your teeth will feel smooth. And because built-up tartar has been removed, you are less likely to develop tooth decay or gum disease. With continued at-home oral care, you can maintain your fresher breath and cleaner teeth until your next dental appointment. Whether you have skipped a few dental appointments, or maintain a regular schedule of bi-annual exams, we can help you preserve a healthy and beautiful smile. Contact Mitchell Dental Spa today to schedule an appointment with us.